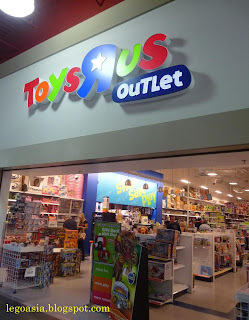 There was a Toys R Us outlet, it is not a store, so it is pretty small. The lego there are limited. I purchased 2 boxes of 9489 Star Wars Battle Pack & 9490 Droid Escape (USD14.99 & USD24.99 exclude tax). For those coming back from US, there is a limit of goods you can carry back to Singapore, all passengers are required to declare at the airport. Total purchase must not be more than S$600, else you have to pay tax at the airport. We just remove all the labels of clothings and bags, for lego it will be alright if you remove them from boxes. It is not worth to take risk, if you are caught a fine will be imposed. After my US trip, i will really think twice before buying from Singapore retail.